Adding powder to makeup foundation helps keep a person’s face from getting too oily or shiny under bright lights. Powder coating does the same thing for cars. Powder coating is far superior in quality, durability over many kinds of paint finish, and it is better for the environment. It is a good choice to help your product look its very best. Powder coating has been used as a dry-finishing process since the 1960s. Powder is sprayed on a metal surface through the process of electrostatic spray deposition (ESD). There is a charge applied to the powder which is attracted to the metal product. This product is then sent into an oven, where it is heated and the powder reacts and covers the product in a durable coating. Why is powder coating a better option than painting? Durability: Powder coating holds up better over time than painted products. The powder coating is stronger and less susceptible to chipping and wear. Products that have to endure harsh environmental conditions hold up better with powder coating. Economy: Since products hold up better with powder coating, they will have a better reputation which will encourage customer loyalty and increase sales. Additionally, there is a lot of loss with painting as the paint is sprayed. This excess constitutes loss. However with powder coating, it is possible to collect and reuse the excess powder. This is a cost-savings benefit for the manufacturer. Safety: It is safer for employees and the environment to use powder coating. Paint contains toxins that are harmful to breathe and are detrimental when released into the environment as waste. The waste from powder coating can be disposed of safely. 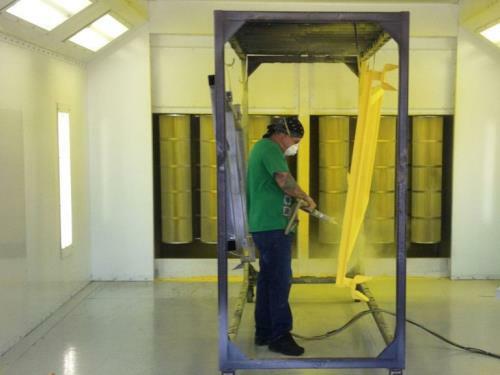 There are many great reasons to consider a powder coating spray booth. WD Services, Inc., a distributor of Global Finishing Solutions, is an expert on paint booths and can direct your company through the process of making a great choice for your production needs. A few of the products we offer include powder coating spray booths, finishing systems, industrial ovens, and dust collection booths. Contact us today to learn more and to explore the solution you need! Previous Post: « What Are Paint Pocket Filters?